This week came the sad news that 1987 Budweiser Irish Derby (Ire-I) winner Sir Harry Lewis has died. (An interesting note for you equine health purists: the Racing Post lists the cause of death as a "heart attack," terminology that is medically inaccurate but commonly used in cases of equine aortic aneurysms and atrial fibrillation.) By coincindence, Sir Harry Lewis came up in a study I worked on this past month, so I thought it would be appropriate to spend a few minutes looking deeper into his story. Perhaps best known in the States as damsire of 2002 Breeders' Cup Classic winner Volponi, Sir Harry Lewis (pedigree) has been a fixture on the MarketWatch list of leading broodmare sires by AEI since he was first eligible for inclusion (2005) in large part due to Volponi's nearly $3.2 million in earnings. Because he has many daughters in active production, we'll see Sir Harry Lewis maintain a leadership position among broodmare sires over the next several years. Much less likely is any chance of the sire line continuing. Sir Harry Lewis descends from a male line that has been decidedly more successful at broodmare production than at turning out popular sires. From Federico Tesio's Tenerani (ITY) and Ribot to the American lines of Tom Rolfe and Hoist the Flag and on to Alleged, the line has rarely branched off with new stallions. Sir Harry Lewis himself has no active stallion sons. His sire Alleged has a handful of sons standing in South America and Great Britain — plus Storada (pedigree) in North Dakota for $300 — but the only upper-tier stud from the immediate line right now is the Hoist the Flag grandson Precocity (SRO) in New Mexico. It requires going back to other sons of Ribot to find popular stallions standing today. The His Majesty branch includes such studs as Cetewayo and Nobiz Like Shobiz and Tiago and Pleasantly Perfect. The sire-line connection is many generations removed from Sir Harry Lewis, but an active Ribot-line stud that factored into another MarketWatch study recently was Raffie's Majesty, discussed here. 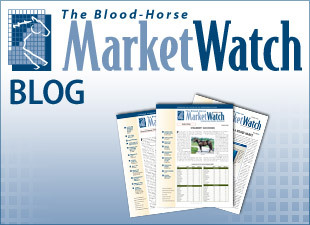 Subscribers to can access past issues in the TBH MarketWatch archives. Note that the Broodmare Sire AEI issue is published as the first issue in Spring each year.